Ajla Aksamija, PhD, LEED AP BD+C, CDT is an Associate Professor at the University of Massachusetts Amherst. She received PhD in Architecture from the University of Illinois at Urbana-Champaign, with an emphasis on technology and environment. Her interdisciplinary research approach spans architecture, engineering, material and computer science. 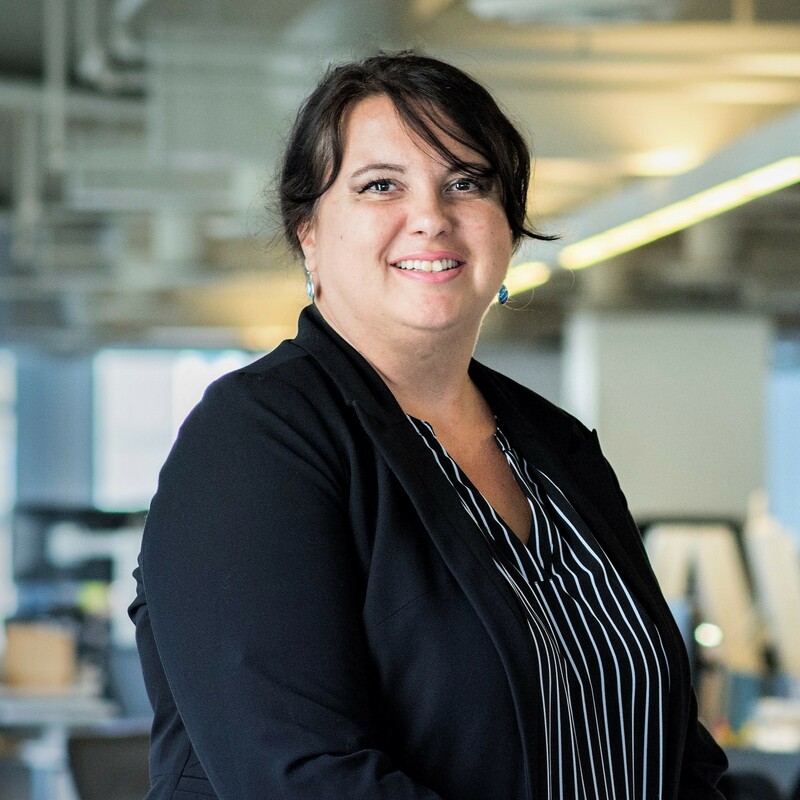 Her research expertise includes building science and sustainability, emerging technologies, digital design and representations, information modeling, and innovations in architecture. Dr. Aksamija directed Perkins+Will Building Technology Laboratory (“Tech Lab”), one of the first practice-driven research laboratories focusing on advanced building technologies, high-performance buildings, computational design, and building facades. Her prior professional experience also includes US Army Corps of Engineers ERDC Construction Engineering Research Laboratory and City of Champaign. She has taught architectural design studios, advanced environmental building design, comprehensive studios and seminars. She has worked on developing building analysis and modeling applications, implementation of novel materials in architectural design, development of computational models, and has collaborated with researchers from material science, civil and environmental engineering and computational design. Her recent book, Integrating Innovation in Architecture, Design, Methods and Technology for Progressive Practice and Research, was published by John Wiley & Sons in 2016. She has also written Sustainable Facades: Design Methods for High-Performance Building Envelopes (John Wiley & Sons). Dr. Aksamija has contributed to several other books, and has published over seventy research articles and invited papers. She has presented at various national and international conferences, and is a frequent speaker at industry-based, scientific and academic conferences. She is the founder and editor of the Perkins+Will Research Journal. Aksamija, A., (2016). Integrating Innovation in Architecture: Design, Methods and Technology for Progressive Practice and Research, Chichester, UK: John Wiley & Sons. Aksamija, A., Haymaker, J. and Aminmansour, A., eds. (2015). Future of Architectural Research: Proceedings of the Architectural Research Centers Consortium Conference, Chicago, IL: Perkins+Will. Aksamija, A., (2013). Sustainable Facades: Design Methods for High-Performance Building Envelopes, New York, NY: John Wiley & Sons. Aksamija, A., (2018). “BIM-Based Building Performance Analysis in Architectural Practice: Using Data to Drive Sustainable Design Strategies”, in Case Study Strategies for Architects and Designers: Integrative Data Research Methods, Magi Sarvimäki, New York, NY: Routledge, pp. 116-122. Aksamija, A., and Wang, Y., (2017). “Regenerative Design for Achieving Net-Zero Energy Commercial Buildings in Different Climate Types”, in Architectural Research Addressing Societal Challenges, Manuel Couceiro da Costa, Filipa Roseta, Joana Pestana Lages and Susana Couceiro da Costa, eds., CRC Press/Taylor & Francis Group, Leiden, The Netherlands, pp. 527-534. Haymaker, J., Aksamija, A. and Green, D., (2015). “Research Mechanisms and Projects at Perkins+Will”, in The Changing Shape of Practice - Integrating Research and Design in Architectural Practice, Michael Hensen and Fredrik Nillson, eds. New York, NY: Routledge, pp. 14-24. Aksamija, A., (2015). “BIM-Based Building Performance Analysis in Architectural Practice: When, Why and How”, in Architecture and Sustainability: Critical Perspectives for Integrated Design, Ahmed Khan and Karen Allecker, eds. Brussels, Belgium: Sint-Lucas Architecture Press, pp 221-230. Zisko-Aksamija, A., (2008). “Knowledge Management in Architecture and Construction Industry”, in Knowledge Management: Research and Applications, Alex Koohang, Keith Harman and Johannes Britz, eds. Santa Rosa, CA: Informing Science Press, pp. 213-252. Grobler, F., Aksamija, A., Kim, H., Krishnamurti, R., Yue, K. and Hickerson, C., (2008). “Ontologies and Shape Grammars: Communication between Knowledge-Based and Generative Systems”, in Design Computing and Cognition ‘08: Proceedings of the Third International Conference on Design Computing and Cognition, John S. Gero and Ashok Goel, eds. Heidelberg, Germany: Springer, pp. 23-40. Aksamija, A., (2007). “Urban Infrastructure and Services: Livable Cities in Balance”, in The Skyscraper and the City: Design, Technology and Innovation, Vol. 2, Lynn S. Beedle, Mir M. Ali and Paul J. Armstrong, Lewiston, NY: Edwin Mellen Press, pp. 411-462 (contributed). Aksamija, A., (2007). “Megacities and Megastructures: Beyond Cities and Skyscrapers”, in The Skyscraper and the City: Design, Technology and Innovation, Vol. 2, Lynn S. Beedle, Mir M. Ali and Paul J. Armstrong, Lewiston, NY: Edwin Mellen Press, pp. 679-736 (contributed). Aksamija, A., Aksamija, Z., Counihan, C., Brown, D., Upadhyaya, M., (2019). “Experimental Study of Operating Conditions and Integration of Thermoelectric Materials in Facade Systems”, Frontiers in Energy Research: Special Issue on New Materials and Design of the Building Enclosure, Volume 7, Article 6, DOI: 10.3389/fenrg.2019.00006 (invited article). Aksamija, A., and Brown, D., (2018). “Integration of Parametric Design Methods and Building Performance Simulations for High-Performance Buildings: Methods and Tools”, Perkins+Will Research Journal, Vol. 10., No. 1, pp. 28-53. Aksamija, A., (2018). “Thermal, Energy and Daylight Analysis of Different Types of Double Skin Facades in Various Climates”, Journal of Facade Design and Engineering, Vol. 6, No. 1, pp. 1-39. Aksamija, A., (2017). “Impact of Retrofitting Energy-Efficient Design Strategies on Energy Use of Existing Commercial Buildings: Comparative Study of Low-Impact and Deep Retrofit Strategies”, Journal of Green Building, Vol. 12, No. 4, pp. 70-88. Aksamija, A., (2017). “BIM and Creativity in Architectural Education: Teaching Advanced Digital Technologies to Beginner Designers”, The International Journal of Architectonic, Spatial, and Environmental Design, Vol. 11, No. 2, pp. 13-25. Aksamija, A., and Peters, T., (2016). “Climate Change and Performance of Facade Systems: Analysis of Thermal Behavior and Energy Consumption in Different Climate Types”, Perkins+Will Research Journal, Vol. 8, No. 2, pp. 52-79. Aksamija, A., (2016). “Regenerative Design and Adaptive Reuse of Existing Commercial Buildings for Net-Zero Energy Use”, Journal of Sustainable Cities and Society, Vol. 27, pp. 185–195, DOI: 10.1016/j.scs.2016.06.026. Aksamija, A., and Peters, T., (2016). “Heat Transfer in Facade Systems and Energy Use: Comparative Study of Different Exterior Wall Types”, Journal of Architectural Engineering, DOI: 10.1061/(ASCE)AE.1943-5568.0000224. Aksamija, A., (2015). “Design Methods for Sustainable, High-Performance Building Facades”, Advances in Building Energy Research, Vol. 10, No 2, pp. 240-262, DOI: 10.1080/17512549.2015.1083885. Aksamija, A., (2015). “A Strategy for Energy Performance Analysis at the Early Design Stage: Predicted vs. Actual Building Energy Performance”, Journal of Green Building, Vol. 10, No. 3, pp. 161-176. Aksamija, A., (2015). “Integrating Building Performance Analysis with Design for High-Performing Facades”, Journal of the National Institute of Building Sciences, Vol. 3, No. 2, pp. 20-25. Aksamija, A., (2013). “Building Simulations and High-Performance Buildings Research: Use of Building Information Modeling (BIM) for Integrated Design and Analysis”, Perkins+Will Research Journal, Vol. 5, No. 1, pp. 19-38. Tang, M., Aksamija, A., Hodge, M. and Anderson, J., (2012). “Performative Computation-Aided Design Optimization”, Architectural Research Centers Consortium (ARCC) Journal, Vol. 9, No. 1, pp. 62-67. Aksamija, A., Snapp, T., Hodge, M., and Tang, M., (2012). “Re-Skinning: Performance-Based Design and Fabrication of Building Facade Components: Design Computing, Analytics and Prototyping”, Perkins+Will Research Journal, Vol. 4, No. 1, pp. 15-28. Abdullah, A. and Aksamija, A., (2012). “Sustainable Design Strategies and Technical Design Development: Rush University Medical Center Entry Pavilion”, Perkins+Will Research Journal, Vol. 4, No. 1, pp. 51-81. Tang, M., Aksamija, A., Hodge, M. and Anderson, J., (2012). “Data Driven Transmutation: an Investigation of Performance Based Design and Adaptive System”, AIA Forward Journal, Summer 2012 Issue, pp. 95-105, (invited article). Tang, M., Aksamija, A., Hodge, M. and Anderson, J., (2011). “Performance-Driven Design and Prototyping: Design Computation and Fabrication”, Perkins+Will Research Journal, Vol. 3, No. 2, pp. 42-49. Aksamija, A., Guttman, M., Rangarajan, H. and Meador, T., (2011). “Parametric Control of BIM Elements for Sustainable Design in Revit: Linking Design and Analytical Software Applications through Customization”, Perkins+Will Research Journal, Vol. 3, No. 1, pp. 32-45. Aksamija, A. and Iordanova, I., (2010). “Computational Environments with Multimodal Representations of Architectural Design Knowledge”, International Journal of Architectural Computing, Vol. 8, No. 4, pp. 439-460 (invited article). Aksamija, A. and Mallasi, Z., (2010). “Building Performance Predictions: How Simulations Can Improve Design Decisions”, Perkins+Will Research Journal, Vol. 2, No. 2, pp. 7-32. Aksamija, A., (2010). “Analysis and Computation: Sustainable Design in Practice”, Design Principles and Practices: An International Journal, Vol. 4, No. 4, pp. 291-314. Aksamija, A., Kui, Y., Kim, H., Grobler, F. and Krishnamurti, R., (2010). “Integration of Knowledge-Based and Generative Systems for Building Characterization and Prediction”, Artificial Intelligence for Engineering Design, Analysis and Manufacturing Journal, Vol. 24, No. 1, pp. 3-16. Aksamija, A., (2009). “Integration in Architectural Design: Methods and Implementations”, Design Principles and Practices: An International Journal, Vol. 3, No. 6, pp. 151-160. Aksamija, A., (2009). “Computational Representations of Architectural Design for Tall Buildings”, Complexity Journal, Vol. 15, No. 2, pp. 45-53 (invited article). Aksamija, A., (2009). “Building Commissioning: Strategies, Criteria and Applications”, Perkins+Will Research Journal, Vol. 1, No. 1, pp. 7-13. Aksamija, A., (2018). “Integrating Parametric Design and Building Performance Simulations”, Proceedings of the Mongeometrija 2018: 6th International Conference on Geometry and Graphics, Novi Sad, Serbia, June 6-9, pp. 526-535. Aksamija, A., (2018). “Methods for Integrating Parametric Design with Building Performance Analysis”, Proceedings of the EAAE/ARCC International 2018 Conference, Philadelphia, PA, May 16-18. Aksamija, A., Aksamija, Z., Counihan, C., Brown, D., Upadhyaya, M., (2018). “Experimental Study on Integration of Thermoelectric Materials in Exterior Walls for Heating and Cooling in High-Performance Buildings”, Proceedings of the Building Enclosure Science and Technology (BEST) 5 Conference, National Institute of Buildings Sciences (NIBS), Philadelphia, PA, April 16-18. Aksamija, A., Aksamija, Z., Counihan, C., Brown, D., Upadhyaya, M., (2018). “Thermoelectric Materials in Exterior Walls: Experimental Study on Using Smart Facades for Heating and Cooling in High-Performance Buildings”, Proceedings of the Facade World Congress 2018, Los Angeles, CA, March 12-13, pp. 171-180. Aksamija, A., (2017). “Energy Performance of Different Types of Double Skin Facades in Various Climates”, Proceedings of the Architectural Research Centers Consortium (ARCC) 2017 Conference, University of Utah, June 14-17, pp. 500-509. Aksamija, A., (2017). “Integration of Parametric Design in Architecture and Building Performance Simulations: Applications for Facade Design”, Proceedings of the 3rd International Biodigital Architecture & Genetics Conference, Barcelona, Spain, June 7-10. Aksamija, A., (2017). “Double-Skin Facades and Daylight Simulations: Comparative Study of Facade Typologies and Effects on Natural Light in Different Climate Types”, Proceedings of the Symposium on Simulation for Architecture and Urban Design (SimAUD) 2017, Toronto, Canada, May 22-24, pp. 203-210. Aksamija, A., (2017). “Thermal and Energy Performance of Double Skin Facades in Different Climate Types”, Proceedings of PowerSkin 2017 Conference, Technical University of Munich, Germany, January 19, pp. 71-82. Aksamija, A., (2016).“Double Skin Facades: Thermal and Energy Performance in Different Climate Types”, Proceedings of the Facade Tectonics 2016 World Congress, Los Angeles, CA, October 10-11, pp. 483-501. Aksamija, A., and Peters, T., (2016). “Impact of Climate Change on Thermal and Energy Performance of Facade Types in Different Climates”, Proceedings of the Facade Tectonics 2016 World Congress, Los Angeles, CA, October 10-11, pp. 235-244. Peters, T., and Aksamija, A., (2016). “Passive Solar Facades, Thermal Comfort and Climate Change: Predictive Simulations with Near and Distant Weather Patterns”, Proceedings of the Passive and Low Energy Architecture (PLEA) 2016 Conference (Cities, Buildings, People: Towards Regenerative Environments), Los Angeles, CA, July 11-13. Aksamija, A., and Wang, Y., (2016). “Regenerative Design for Achieving Net-Zero Energy Commercial Buildings in Different Climate Types”, Proceedings of the EAAE/ARCC 2016 Conference, Lisbon, Portugal, June 15-18. Aksamija, A., (2015). “Regenerative Design of Existing Buildings for Net-Zero Energy Use”, International Conference on Sustainable Design, Engineering and Construction 2015, Chicago, May 10-13. Aksamija, A., (2015). “High-Performance Building Envelopes: Design Methods for Energy-Efficient Facades”, Proceedings of the Building Enclosure Science and Technology (BEST) 4 Conference, National Institute of Buildings Sciences (NIBS), Kansas City, MO, April 12-15. Wang, Y. and Aksamija, A., (2015). “Net-Zero Energy Retrofits for Commercial Buildings”, Proceedings of the Architectural Research Centers Consortium (ARCC) 2015 Conference, Chicago, April 6-9, pp. 222-230. Tabataabaee, S., Weil, B. and Aksamija, A., (2015). “Negative Life-Cycle Emissions Growth Rate through Retrofit of Existing Institutional Buildings”, Proceedings of the Architectural Research Centers Consortium (ARCC) 2015 Conference, Chicago, April 6-9, pp. 212-221. Aksamija, A., (2015). “Innovation and BIM in Architectural Education: Teaching Advanced Digital Technologies to Beginner Designers”, Proceedings of the 31st National Conference on the Beginning Design Student 2015, University of Texas, Houston, February 26-28, pp. 28-35. Aksamija, A., (2014). “Design of Sustainable, High-Performance Building Facades”, Proceedings of the 9th Energy Forum on Advanced Building Skins, October 28-29, Bressanone, Italy (invited paper). Aksamija, A., Abdullah, A. and Cross, B., (2014). “Whole Building Energy Analysis: A Comparative Study of Different Simulation Tools and Applications in Architectural Design”, Proceedings of the 2014 ACEEE Summer Study on Energy Efficiency in Buildings, Pacific Grove, CA, August 17-22. Aksamija, A. and Abdullah, A., (2013). “Building Technology Research in Architectural Practice: Lessons Learned from Implementations of Energy-Efficient Advanced Building Technologies”, Proceedings of the 2013 ACEEE Summer Study on Energy Efficiency in Industry, Niagara Falls, NY, July 23-26. Aksamija, A. and Green, D., (2013). “Visibility of Research in Design Practice: Current and Emerging Trends”, Proceedings of the Architectural Research Centers Consortium (ARCC) 2013 Conference, Charlotte, NC, March 27-30, pp. 661-668. Aksamija, A., (2012). “BIM-Based Building Performance Analysis: Evaluation and Simulation of Design Decisions”, Proceedings of the 2012 ACEEE Summer Study on Energy Efficiency in Buildings, Pacific Grove, CA, August 12-17. Tang, M., Aksamija, A., Hodge, M. and Anderson, J., (2012). “Performance-Based Generative Design Process: An Investigation of the Parametric Nature of Architecture”, Proceedings of the 100th ACSA Annual Conference: Digital Aptitudes, Boston, MA, March 1-4. Aksamija, A., (2011). “Building Technology Research in Architectural Practice: Emerging Trends”, Proceedings of the 2011 ARCC Spring Research Conference, Architectural Research Centers Consortium, Plowright, P. and Gamper, B., eds., Detroit, MI: Lawrence Technological University, pp. 585-594. Aksamija, A. and Iordanova, I., (2009). “Multimodal Representations of Architectural Design Knowledge”, Proceedings of the CAAD Futures 2009 Conference: Joining Languages, Cultures and Visions, Montreal, Canada: Les Presses de l’Universite de Montreal, pp. 642-655. Aksamija, A. and Ali, M., (2008). “Information Technology and Architectural Practice: Knowledge Modeling Approach and BIM”, Proceedings of AIA IL Conference: Breaking New Ground, Moline, IL, November 7-8. Grobler, F., Zisko-Aksamija, A. and Kim, H., (2008). “Ontological Representation of Design Knowledge”, Proceedings of the 12th International Conference on Computing in Civil and Building Engineering, 2008 International Conference on Information Technology in Construction, ICCCBE-XII, Beijing, China, October 16-18.